These consistently popular tall tough lavenders have great presence as specimens or hedges. Their unsurpassed scent and colour are evocative of high summer. Hardy to at least -15°C, they will cope with most British weather. 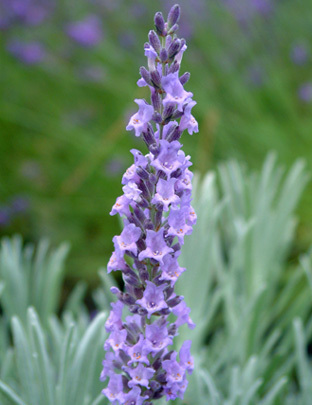 They are a sterile hybrid of angustifolia subspecies angustifolia and latifolia (Spike Lavender). 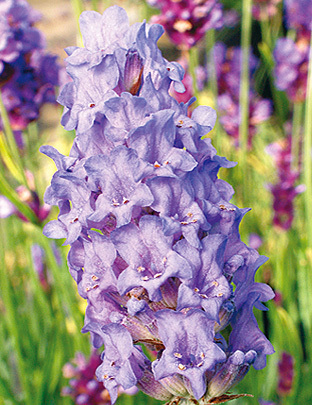 The name intermedia just means ‘between’ and although the common name for the hybrid is Lavandin they are usually, if rather confusingly, referred to as lavender. Flower heads are conical and are strongly scented, mildly camphoraceous and appear during July and August, although some continue into autumn. This is the most popular species grown for oil extraction, higher yielding than angustifolia, but producing lower quality camphoraceous oils, used in cheaper perfumes, soaps, cosmetics and detergents. Widely used for drying off the stalk and stripped as grains for scenting pot-pourri. Use sparingly as a culinary herb. In that capacity it’s best to use them in cooked food. This acts to temper the more lively flavour! This pale purple-flowered lavender has the longest flowers of any hardy lavender in our collection. Stunning when planted en masse. Next available early June. A great variegated lavender. The green-grey leaves have cream margins. Pale purple flowers. Next available early June.